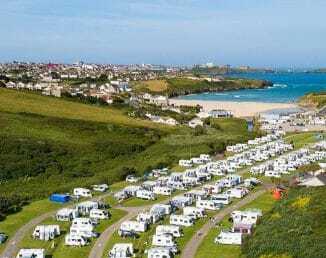 Enjoy the late spring sunshine and beat the Summer rush with a May break in Cornwall at Porth Beach Holiday Park. May is a great time to visit Cornwall. Enjoy summer-like temperatures, compared to the rest of the UK, sample top local events and experience great holiday activities this May! And at Porth Beach you can also snap up some great value breaks, with prices starting from just £305! Padstow May Day: 1st May: May Day (or ‘Obby ‘Oss Day as it is known) is the biggest day in Padstow’s calendar. It is not unusual to see 30,000 people crammed into this little town on the day when Padstonians from all over the world return to their roots. St Agnes Bolster Festival, 1st May: A celebration of Cornish music and art featuring life size puppets, a drum band and a 28ft giant effigy re-enacting the famous Cornish legend of the giant called Bolster. A great day out for all the family. Fowey Festival of Arts & Literature, 6th-13th May: Exciting programme includes talks, interviews, creative and practical workshops, exhibitions, presentations, theatre, musical concerts, an Art trail, guided walks and river cruises to enjoy, inform, challenge and inspire the imagination. Aspall Polo On The Beach: 19th-21st May: Polo on the Beach weekend event takes place at Watergate Bay near Newquay, with the promise of speed and excitement featuring some of the country’s top professional polo players. As well as sampling some of the great local events, May is also the perfect time of year to experience the great outdoors. Slightly cooler than July and August but still nice and warm, May is ideal for walking the South West Coast Path. Enjoy the cooling breeze coming off the coast as you take in some of the UK’s most spectacular coastal landscape! You can pick up the South West Coastal Landscape from right outside our holiday park too. Here at Porth Beach we’re fortunate to be based 150 yards from the beach and close to some of the county’s most popular (and must-see) destinations. From Newquay and Padstow to Port Isaac and Boscastle, there’s so many picturesque places to see close by. So, what are you waiting for? Check out our range of caravan holiday homes, touring and camping pitches or glamping pods and book your May break in Cornwall! Call us on 01637 876531 or click here to book on-line!